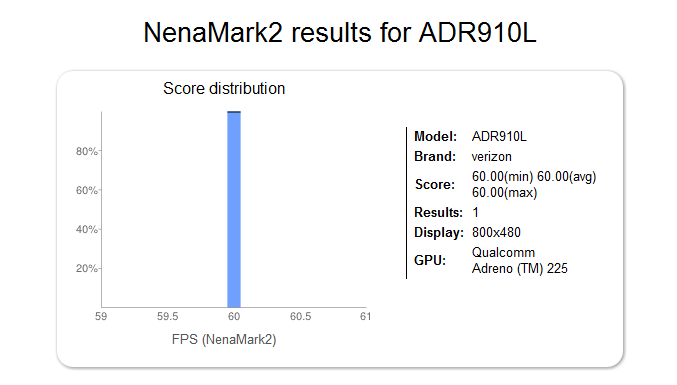 Could this be a NenaMark 2 benchmark for a new Pantech (model number ADR910L) device headed to Verizon? 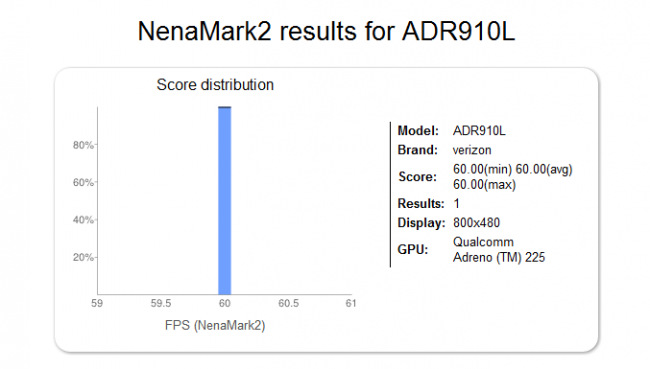 From looking over the benchmark, we can see it sports the Adreno 225 GPU which points to a Qualcomm S4 chip, Ice Cream Sandwich, and we assume it will have 4G LTE aboard since VZW has stated that they would be only launching devices with 4G LTE capability in 2012. So, could this be the next iteration of the Breakout which was model number ADR8995? The S4 and ICS do make it sound nice, but with a reported resolution of just 480×800, we shouldn’t expect this to be the next superphone everyone is dying to get their hands on. For those interested in mid-range devices, having the S4 processor for a much more affordable price will be a major draw though. Our ears are officially perked for more info on this handset.